That job is not without challenges, such as the weather disasters, economic challenges and trade complications seen in 2018. However, Duvall said that 2018 was also a year marked by big victories on issues affecting farm and ranch families across the nation. 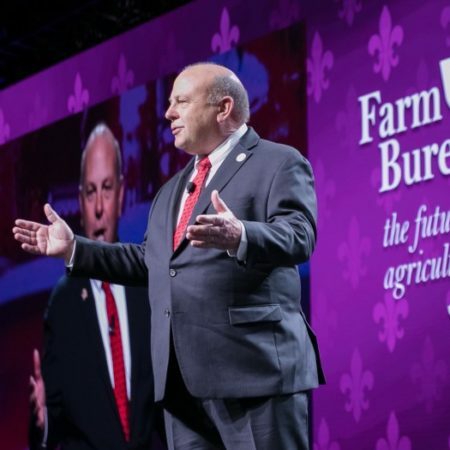 “Most of us are happy to see 2018 in the rear-view mirror, but on the policy front 2018 could go down in our history as a huge success story,” Duvall told the farmers and ranchers gathered in New Orleans for the organization’s centennial meeting. The list of victories starts with tax reform, which lowered tax rates for almost every farmer and rancher. That effort included a doubling of the estate tax exemption for farm families, a long-sought goal of the American Farm Bureau, Duvall said. Another big win, according to Duvall, was passage of the 2018 farm bill, which improved risk management tools, protected the availability of crop insurance and provided essential funding for trade development, agricultural research and development, and programs for beginning farmers. Reform of expensive and overreaching regulations continues to be a bright spot for agriculture. Duvall said the Trump administration has taken 28 deregulatory actions thus far, with about half of those related to agriculture. Duvall listed a few of the 50 additional initiatives in the works, such as an exemption for electronic logging devices for livestock haulers and rules governing the renewable fuel E15. One of the brightest points in the regulatory reform area is the new Clean Water Rule proposed by the Environmental Protection Agency and the Army Corps of Engineers. That rule is being proposed to replace the flawed and unworkable 2015 WOTUS rule. As for the year ahead, Duvall told members to gear up for additional opportunities related to regulatory reform, farm labor, trade and infrastructure, including rural broadband. In closing, Duvall told members he views Farm Bureau as a big family.